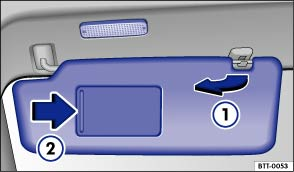 With the sun visor folded down, there may be a make-up mirror behind a cover. When you open the cover , a lamp lights up. The lamp will go out when the make-up mirror cover is pushed back or the sun visor is folded back up.